If you know my family, we have this weirdness with pig nicknames. 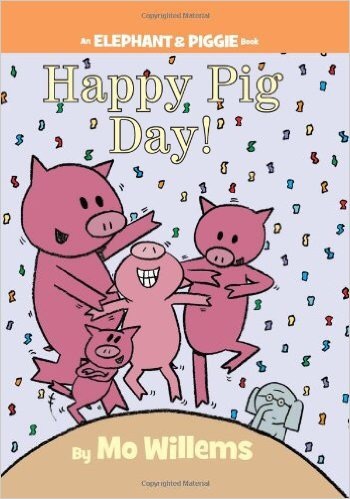 Upon the arrival of my new niece last year, I wanted to start on her a book series, and while browsing our school book fair came across a story called Happy Pig Day by Mo Willems. I was immediately drawn to the title, but in all honesty, the book itself didn’t look that appealing to me. It’s written in comic style, with colour-coordinated speech bubbles for the characters, Gerald and Piggie. However, once I started reading it, I couldn’t put it down. The characters are so lovable, empathetic, and melted my heart. My cousin, of course, agreed! It wasn’t until recently when I came across a different story from the series, and thought about reading it to my grade 4 class. I was hestitant because of the simplicity of the book, but was surprised with a loud applause after we read it. Like me, they too are now addicted! They seek the series out at the library, share them with each other, and are constantly recommending a new story from the series. “Why?” I wondered. Sometimes I think as teachers we’re caught up in the need to teach our kids to read. To teach them to challenge themselves. To encourage them to read chapters book. But have we forgotten to teach our kids to enjoy reading? Don’t we want them to connect and relate to the characters? Find humour in texts? Empathize? This series has opened the doors for me in my classroom to teach children about friendship, character, and life lessons, but more importantly to be able to find themselves in a book! I challenge you to do the same.